Members of the ICGC are committed to the principles of rapid data release. However, like other large-scale genomic projects, members do not consider the deposition of its data into its own or public databases to be the equivalent of publication in a peer-reviewed journal. Therefore, although the data are available to others, the members still consider them to be formally unpublished. The members of the ICGC have adopted data release policies that will accelerate the dissemination of datasets through rapid data releases that will precede publication of the global analyses of ICGC member datasets, anticipating the data will be useful for many investigators. The Consortium anticipates that the Project's data will be used in many ways, such as in developing new analytical methods, in understanding patterns of somatic mutations, and in guiding selection of mutations, genes, and other targets that will be used to develop biomarkers for cancer detection, diagnosis and prognosis, and new therapeutic interventions. Thus, the Consortium recognizes that the data are available to many users for a variety of purposes. All data shall become free of a publication moratorium when either the data is published by the ICGC member project or one year after a specified quantity of data (e.g. genome dataset from 100 tumours per project) has been released via the ICGC database or other public databases. In all cases data shall be free of a publication moratorium two years after its initial release. Scenario 1: 1 genome is submitted and made available on the ICGC portal, and two years later the moratorium period is finished. Scenario 2: 100 genomes are submitted and made available on the ICGC portal, and one year later the moratorium period is finished. Scenario 3: 1 genome is submitted and a few months later, a total of 100 genomes are made available on the ICGC portal, and one year later the moratorium period is finished. Scenario 4: 1 genome is submitted and several months later, a total of 100 genomes are made available on the ICGC portal. 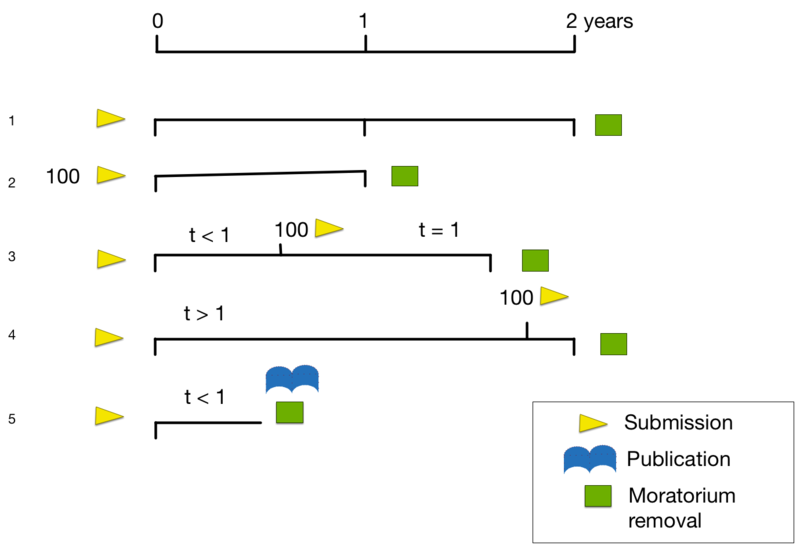 When a total of two years from the time of the first genome is reached, then the moratorium period is finished. Scenario 5: Any number of genomes are submitted and made available on the ICGC portal, and a paper about them is published by the submitting group, the moratorium period is finished.